If you previously considered but passed on a shipping container solution for a storage, industrial equipment enclosure, mobile office, or workforce living application, we encourage you to give Falcon Structures’ repurposed shipping containers another look. We get it. Even as recently as a few years ago, finding cost-effective, reliable shipping container solutions could be a challenge. Most repurposed shipping container providers only offered custom solutions that were too expensive and would not meet your schedule. Fortunately, shipping container structures have come a long way, thanks to the time-tested manufacturing processes Falcon Structures has put in place. We can meet your cost and schedule demands. Here are four reasons to reconsider Falcon’s shipping containers, which are trumping other shipping container manufacturers and traditional modular building structures in terms of durability, cost-effectiveness, flexibility, faster time to revenue, and more. No. 1: We have many years’ worth of experience - in our manufacturing plant and in the field - learning what works, what does not, and what is safe. In the early days of the container structure industry, the quality and safety of container solutions varied greatly. Shipping containers were considered unproven, and potential buyers were concerned about leaks, durability, cost of ownership, and comfort. Since 2003, our design and engineering team has focused on developing tried-and-true, repeatable manufacturing processes that reduce costs and ensure consistent product quality and safety. No. 2: Standardized products streamline manufacturing and simplify the purchasing process. We’ve been fine-tuning our standard products for several years, based on client requests and our commitment to offering safe, durable, and cost-effective solutions. Simply download our digital product catalog to learn more. In addition, all Falcon standard shipping containers can be customized based on your individual needs. You’ll find our most popular shipping container options included in the standard product catalog, or you can visit our shipping container modifications page here. No. 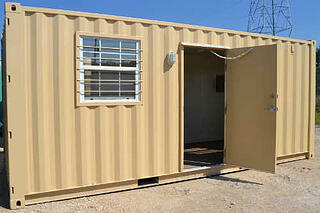 3: Falcon’s modified shipping container solutions enhance your business agility in several ways. First, thanks to our substantial manufacturing capacity, Falcon offers the fastest and most reliable delivery time in the industry. 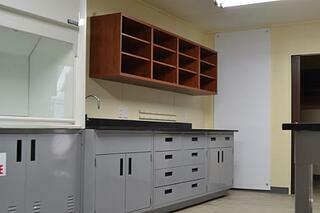 Second, we provide turnkey container solutions. Even electrical and plumbing features are ready to connect once the container arrives onsite. Your time to first use is measured in hours, not weeks. Third, Falcon’s speed of manufacturing, delivery, and installation ensures faster time to revenue. Fourth, our self-contained solutions improve your agility. When you use a modular shipping container solution instead of a traditional building solution, you will save time and money. That cost and time savings means lower risks to your project. We can manufacture, deliver, and install your container solution in as little as a few weeks. Building a permanent structure takes much more time. Foundations are much simpler and less expensive for a container than a permanent structure. You will need fewer workers to complete the project compared to a permanent structure. You will minimize waste when you can simply move your container to a new job site. Idle permanent structures waste time, money, and materials when job sites move. No. 4: The inherent durability and mobility of shipping containers. Safe and secure. Falcon living, working, and storage spaces were engineered to protect what's important. Constructed of heavy-duty, 16-gauge, Corten steel, connex shipping containers are also incredibly difficult to break into. Durable and weather-resistant. Shipping containers last 25 years on average and were designed to keep wind and moisture at bay, even during the most extreme weather conditions. We even offer insulated, climate control options to provide optimum comfort. Easy to relocate. 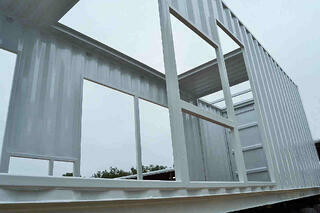 Repurposed ISO shipping containers typically require no special foundation or pre-installation prep work. Since they come with built-in logistics handling points, shipping containers can be easily moved around a job site with a forklift or loaded onto a truck, train, or ship to be transported across the country or sea.